City Shrouded in Shadow (Japanese: 巨影都市 Kyoei Toshi) is a video game for the PlayStation 4 developed by Granzella, who confirmed that it is the spiritual successor to their Disaster Report series of games. The objective of the game is to escape a city ravaged by battles between giant monsters, kaiju, robots, and heroes from famous live-action and animated Japanese series such as Godzilla, Ultraman, Gamera, Patlabor, and Neon Genesis Evangelion. 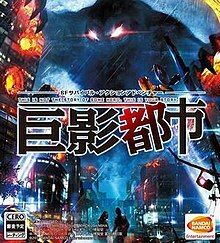 The game is set in the fictional Ichi City in Japan, which is being beset by sinister shadows and giant monsters. The player will be able to choose between either playing as a man called Ken Misaki or a woman called Miharu Matsuhara (the character may be renamed), with the objective being to try to escape the city. The game was announced on September 17, 2015. It was developed by Granzella and directed by Kazuma Kujo. Takashi Watabe is producing on behalf of publisher Bandai Namco. Ultraman was confirmed to appear in the game on 16 February 2016. The Japanese gaming magazine Famitsu confirmed that Godzilla would appear in the game. Godzilla had previously been teased by having his shadowy silhouette appear in screenshots. An Evangelion mecha was also teased to appear. Famitsu confirmed in May 2017 that Gamera would also appear in City Shrouded in Shadow. In May 2017 it was announced that the PS Vita version was cancelled, the title became a PS4-only exclusive. The game launched on October 19, 2017 in Japan. The game sold 48,935 copies within its first week on sale in Japan, placing it at number two on the all format sales charts. ^ Barder, Ollie (5 July 2017). "'City Shrouded In Shadow' Adds 'Patlabor' To The Mix". Forbes. Game News. Retrieved 2 September 2017. ^ Romano, Sal (1 December 2016). "Disaster Report 4 Plus official website relaunched, VR demo set for Nagoya exhibition". Gematsu. Latest News. Retrieved 13 December 2016. ^ Wong, Sato (14 December 2015). "Project City Shrouded in Shadow Shows Its Destructive Teaser Trailer". Siliconera. News. Retrieved 16 April 2016. ^ a b Gelmini, David (2 February 2016). "Ultraman Stars in Upcoming Horror Game Project City Shrouded in Shadow; Godzilla Also?". Dread Central. News. Retrieved 16 April 2016. ^ Romano, Sal (17 September 2015). "Granzella and Bandai Namco announce Project City Shrouded in Shadow for PS4, PS Vita". Gematsu. Latest News. Retrieved 16 April 2016. ^ Blyden, Jabulani (22 March 2016). "New Kyoei Toshi Game Images Reveal Godzilla & Apparent Evangelion Silhouette". Anime News Network. News. Retrieved 16 April 2016. ^ Romano, Sal (16 February 2016). "Ultraman is in Granzella's City Shrouded in Shadow [Update]". Gematsu. Latest News. Retrieved 16 April 2016. ^ Romano, Sal (22 March 2016). "City Shrouded in Shadow adds Godzilla, teases Evangelion". Gematsu. Latest News. Retrieved 16 April 2016. ^ Wong, Sato (22 March 2016). "It Looks Like Evangelion Is Making Its Way Into City Shrouded in Shadow". Siliconera. News. Retrieved 16 April 2016. ^ a b Romano, Sal (May 30, 2017). "City Shrouded in Shadow now PS4-only, launched in October 2017. [Update 3]". Gematsu. Latest News. Retrieved May 30, 2017. ^ Romano, Sal (4 July 2017). "City Shrouded in Shadow launches October 19 in Japan, adds Patlabor [Update]". Gematsu. Latest News. Retrieved 4 July 2017. ^ Roman, Sal (November 2, 2017). "Media Create Sales: 10/16/17 – 10/22/17". Gematsu. Latest News. Retrieved October 25, 2017.